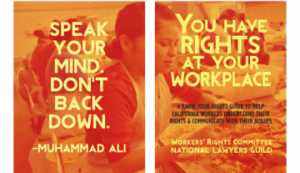 Workers Know Your Rights booklet now available! It is crucial that as workers, immigrants, community members, activists, and legal workers, we know our rights. The Know Your Rights booklet is a powerful tool, made even more so by the internet, which is why NLG distributes these resources. All workers—citizens and non-citizens, documented and undocumented—have rights that protect them at work. This booklet provides an overview of California workplace rights in everyday English and is designed to clarify the law and empower workers. In some situations it will be possible to proceed without an attorney. While this booklet is not a substitute for legal advice, it will help workers to understand their rights and take real steps to protect them. In complex situations or those involving possible lawsuits, it is recommended that you seek legal advice from an attorney. The advice in this book is not intended for workers who are represented by a union or who work directly for a government agency, such as a city or public school district. Different rules may sometimes apply to such workers. This updated Know Your Rights booklet in English and in Spanish covers worker rights. It is available as a regular document or as a print-and-fold document which becomes a small booklet if you print it out double-sided, cut it in half horizontally (so that you create twice as many 8.5 x 5.5″ sheets) and then stack them in order and staple at the center.